Gold Coast, Jan. 5 (NsNewsWire) — World champion hurdler Sally Pearson and decathlete Cedric Dubler got their first look at the newly laid athletics track at Carrara Stadium with only three months to go until the Opening Ceremony of the Commonwealth Games. Pearson is gunning for a third consecutive Commonwealth Games gold medal in the 100m hurdles after winning in Delhi in 2010 and Glasgow in 2014. For the Gold Coast local, the chance to walk the Commonwealth Games track and visualise the event has been a long time coming. “It’s really exciting, competing at major championships is what I love to do,” Pearson said. “To be able to drive 10 minutes down the road and be in the Commonwealth Games stadium is something so surreal. “It gives you a buzz just walking into the stadium and looking around and imagining what it is going to be like when it is full. “It definitely feels so real, it is 14 weeks until I race here, wow, I’m going to be racing in my hometown in front of the people who have been supporting me. It is going to be really special for most Australians competing. Sally Pearson practices her dip at the finish line of the newly laid GC2018 athletics track at Carrara Stadium on the Gold Coast. It is a busy period for the recently crowned world champion, who will compete in her first hurdles race of the season next Saturday in Perth, with Canberra and Brisbane races to follow. Pearson will return to the Gold Coast for the national trials on the new GC2018 track in February before heading to Birmingham for the world indoor titles. Pearson will be a heavy favourite to win in front of an adoring home crowd in the biggest event held in Australia this decade, but it won’t be a fait accompli. “It is going to be tough,” she said. While all eyes will be on Pearson, decathlete Dubler is hoping to continue his impressive rise to prominence at Carrara Stadium. He was the revelation of the 2016 Olympic trials in Sydney when he produced a huge personal best score (8,114 points) to become the first Australian decathlete to qualify for the Olympics since 2000. Backing up his trial performance, Dubler placed 14th in Rio with a score of 8,024 points, the best by an Aussie in 32 years. Decathletes spend two long days competing across 10 events; the 100m, long jump, shot put, high jump, 400m, 110m hurdles, discus, pole vault, javelin and 1,500m. “The track is looking good and feeling good. There is a good vibe in here, just standing at the start line of the 100 metre straight is exciting,” Dubler said. “I can already visualise what the stadium is going to feel like with 35,000 people cheering. “I’ve looked around the track and looked at the pole vault where there is seating for 9,500 fans behind that. So that will be a really good atmosphere for that and the shot put. “Our race is not over in 12.5 seconds like Sally’s, we spend two long days out here, over 10 different events. That’s one of the things I love about the Decathlon. “Hopefully I’m selected and it would be an immense sense of pride to be called out and that will feed into the excitement and the atmosphere which will become energy and hopefully help me perform better. There are still tickets available to watch the best athletes compete at Carrara Stadium. The memories will last but the tickets won’t. 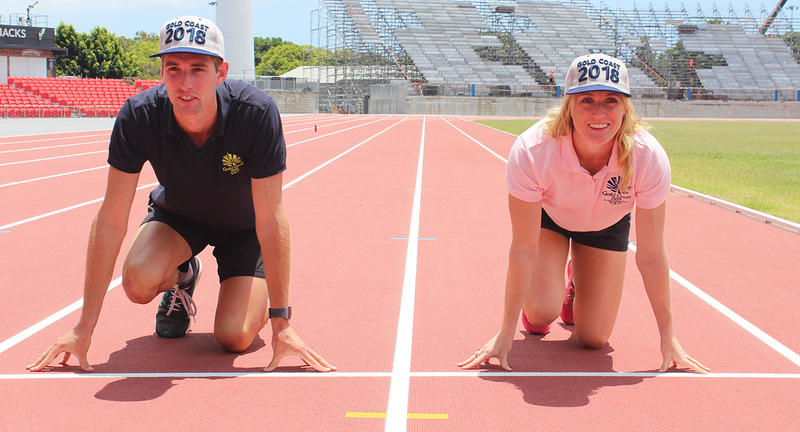 Cedric Dubler and Sally Pearson check out the newly laid GC2018 athletics track at Carrara Stadium.